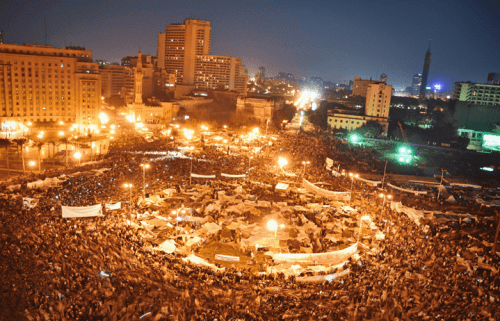 Tahrir Square on February 8, 2011 (photo by Jonathan Rashad, via Wikimedia Commons). Earlier this month, Judge Muhammad Shereen Fahmy of the Cairo Criminal Court sentenced Egyptian activist Ahmed Douma to 15 years in prison and a fine of six million Egyptian pounds in a retrial of the “Cabinet Clashes” case. The case dates to a December 2011 sit-in in which hundreds of peaceful protesters—many of whom had taken part in the January 25 Revolution eleven months before—had been violently dispersed, beaten, and dragged by security officials, and sentenced en masse while the perpetrators enjoyed impunity. Though Douma’s sentence is, on its own, egregiously severe, it is the lengthy comments that Fahmy delivered before announcing the verdict that are particularly instructive in understanding how the Egyptian state and its apparatuses have systematically attempted to rewrite the story of the revolution in the eight years since Egyptians took to the streets. Referring to those who participated in the revolution as “a group of idiots and mercenaries who are intellectually defeated and socially bankrupt,” Fahmy delivered a politicized oratory in which he vilified and condemned an entire generation of youth activists. He challenged their patriotism, implied that they were working to destroy the country, and described their goal as attempting to upset society’s foundational values. Using his platform in what seemed to observers as a trial of the entire revolution, Fahmy went on to describe the revolutionaries as “liars, deceivers, social climbers, spiteful imposters…who falsify the truth and mislead the public,” in an attempt to upset the stability of the nation and to create a division between “the people and their protectors.” The judge also made sure to emphasize that if “his hands were not tied” due to the law, he would have sentenced Douma to a much heavier jail term. Though Fahmy’s comments underscore the dangers of Egypt’s increasingly politicized judiciary, his attitude is not out of place in a country in which a revolution that was initially celebrated and honored, now faces systematic denigration through the treatment of its participants and the rhetoric and remembrance around its occurrence. With the goal of silencing their voices, Egyptian authorities have singled out the women and men who participated in the revolution, aiming to stop them from iterating the demands of the revolution and working to realize its goals. Officials have dedicated both old and new legislation that cracks down on expression, association, and assembly. They have used a set of administrative and judicial tools to target and detain individuals active in the revolution, like April 6 member Mohamed Adel, who had been sentenced to three years of jail time and three years of parole in 2013 only to be rearrested again in the middle of last year; and to leave activists, like Hend Nafea, with no choice but to live in exile apart from their homes and families. The case of Douma is not an aberration, but a window into these practices. With an eye toward the future, Egyptian authorities have been careful to control the way in which the revolution is studied and spoken about by the country’s youngest generations. Immediately after Hosni Mubarak’s ousting, the history curricula of schoolchildren were changed to incorporate sections about the revolution, spotlighting movements like Kefaya and April 6 as its predecessors. As dynamics changed, however, so did the curricula; in the wake of June 2013, for example, content was added about the “June 30 Revolution” and the Tamarod movement was spotlighted. Eventually, in 2017, news surfaced that the Ministry of Education would remove content about the revolution and June 30 from school curricula entirely, with at least one source claiming that a period of at least 10 years should pass before a historical event is studied and its underlying causes understood. Whether through measures to silence the individuals who participated in the revolution and who represent the democratic rights framework amplified by it, through tight control of the public narrative, or through redesign of the ways in which younger generations study Egypt’s modern history, Egyptian authorities have taken clear and systematic measures to erode the impact of the revolution on modern society. By doing so, they seek to bring the country’s population back to not only to its pre-revolution era, but to an era in which absolute control is exercised on every aspect of citizen life, including the memory of January 25.